AMD’s highly anticipated 2nd generation enthusiast Ryzen Threadripper processors are only weeks away from launch and as such we’re witnessing a noticeable uptick in leaks surfacing around these parts. In fact, three of AMD’s upcoming second generation Ryzen Threadripper 2000 series CPUs have been spotted on the HWBOT database. The entries in the HWBOT database include clock speeds, power envelopes and core counts, confirming earlier leaks about the Ryzen Threadripper 2950X part as well as confirming the specifications of a new 2970X SKU. The three leaked SKUs are the already well known 32 core Ryzen Threadripper 2990X flagship part in addition to a new, 24 core Ryzen Threadripper 2970X and a previously leaked 16 core Ryzen Threadripper 2950X SKU. AMD officially introduced the Ryzen Threadripper 2000 series at Computex, earlier this year, where the company debuted the world’s first 32 core desktop processor. The company revealed that the processors would launch in the second half of the year and earlier this month we managed to confirm the launch date to be the 13th of August, less than two weeks from today. We haven’t confirmed yet whether all three of the aforementioned SKUs will debut on the 13th, but all three will be available on shelves before year’s end. Alongside these new parts will be a set of brand new X399 motherboards from AMD’s motherboard partners Asus, ASRock, Gigabyte & MSI. Although, existing X399 motherboards AMD has assured the press will also support the new SKUs. If true, this means that first generation Threadripper users can double their core count without much hassle, a mighty tempting proposition for those productivity freaks out there. A reddit user has spotted four Threadripper SKUs on AMD’s website listed below, although with zero info attached. AMD has always referred to the flagship as the 2990X, the added W to the 2990X and 2970X are peculiar. A theory floating around is that the W could stand for a water cooled version of the same chip, but that’s just speculation. 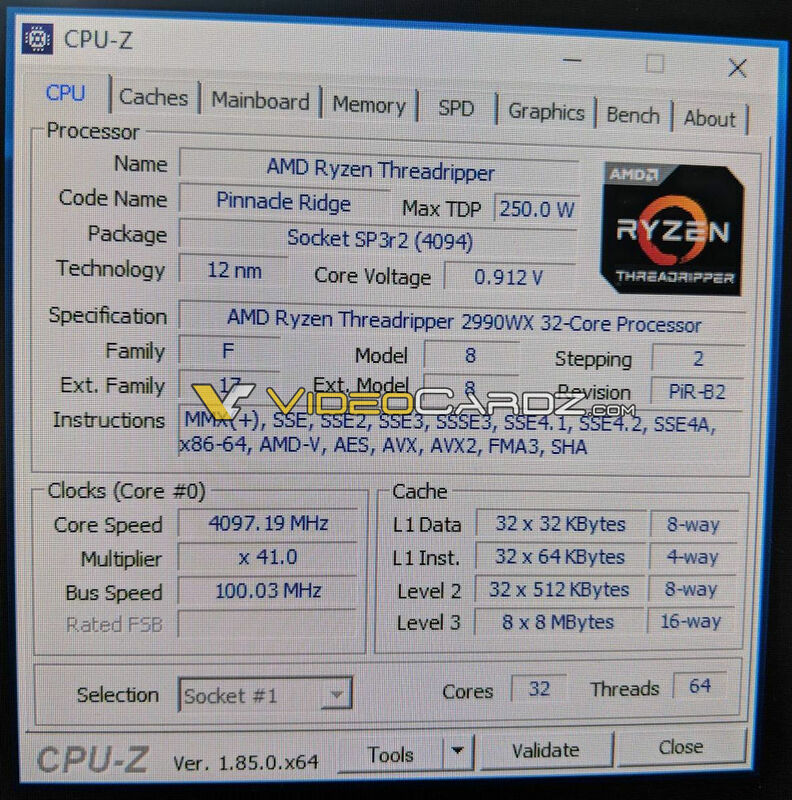 A CPU-Z screenshot of the Ryzen Threadripper 2990WX has made its way to the web, courtesy of VCZ. This particular monstrosity of a chip has been confirmed to feature a base clock speed of no less than 3.4GHz, which is downright unheard of for a CPU with this many cores. It’s also said to feature a Turbo clock speed 4.20 GHz with XFR2. A feat that’s attributed in part at least to GlobalFoundries’ new 12nm manufacturing process that we’ve seen debut with the mainstream AM4 2nd gen Ryzen parts. Quite uncharacteristic for a monster like this, the TDP comes in at surprisingly reasonable 250W for a 32 core, 64 thread part. In comparison, the company’s brand new 2700X 2nd gen Ryzen is rated at 105W and that’s just an 8 core part with clock speeds not much higher than those of the 2990X. The 2990X is expected to launch on August 13th at $1500. 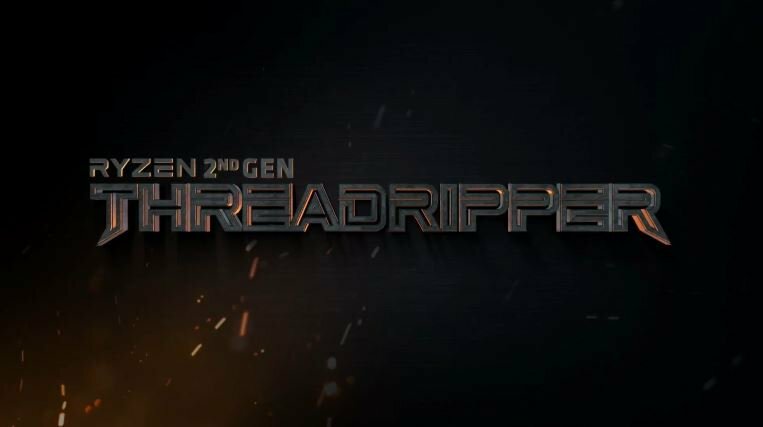 Next up we have the company’s brand new ##70X Threadripper SKU. This chip will slot in right under the 2990X and will feature 24 cores and 48 threads. This chip runs at an even higher base clock speed of 3.5GHz. The maximum clock speed of this part however is not yet known, but it’s reasonable to expect that it will at least match that of the 2990X at 4.2 GHz. Unfortunately we don’t have an MSRP for this part, but it’s reasonable to expect it to come in under the $1499 MSRP of the 2990X, potentially replacing the 1950X at $999-$1199. Next up we have the 2950X, this part will feature 16 cores and 32 threads, just like its 1950X predecessor. Unlike its 180W predecessor however, this part is rated at a frugal 125W watts and will run at a slightly lower base clock speed of 3.1 GHz. This hints that this part may very well NOT be a replacement for the 1950X and could in fact come in at a lower price point to replace the 1920X instead at $599-$799, leaving the brand new 2970X to replace the 1950X. Listed on AMD’s website is a very peculiar SKU that has yet to be leaked anywhere, except well on the company’s own website. We don’t know anything about this chip at the moment, but we could reasonably assume that it’s a 12 core replacement to the 1920X and probably another 125W SKU in the 2nd gen Threadripper lineup. It’s going to be very interesting to see how the company is going to choose to price this part. Which AMD Ryzen Threadripper CPU Are Most Interested in ?